2494 So. Ocean Blvd. Here you have luxury living in a 5-star oceanfront complex. Full service building with 24/7 guard gate, valet and concierge services for 2-4 bedroom units ranging from 2130-8500 sq ft. Larger units have all the features of a house with condo amenities for easy care and security when you are not there, and some have their own private pools-the height of luxury in an oceanfront condo. 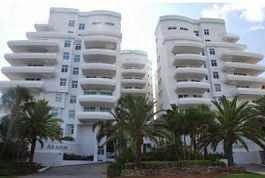 The three sister-towers were built in 1995 on A1A’s Boca Raton Gold Coast, south of Camino Real. If you enjoy architectural details you will marvel at this complex’s features. New York designer Melvin Dwork created an Asian-inspired motif. The curved balconies and building tops present a contemporary element. Elevators open into the units. Amenities include spectacular oceanfront pool with attendants, direct beach access, clubhouse, fitness center, community room, sauna, squash court, bike storage. Lease OK, up to 50+ lbs. pet. Maintenance includes basic cable. Area public schools are all A-Rated. Three 3-bedroom units are available right now, each a little larger than 4000 living sq ft, two on the 4th floor for $2499,500 and $1,299,900, and 1 on the 8th for $3,395,000. MARILYN KNOWS THE WATERFRONT and will be happy to show you these or any other properties!